Sangria is one of those drinks I can remember imbibing years ago. I was not overly fond of the fruit, and did not even think to make this at home. But, it has been a long hot summer and lazy afternoons have called for something cold to drink. It is the festive season, and a festive drink has been in order. This really meant that I just had to make sangria. The orange juice makes it quite refreshing, and I have been topping it up each day for over two weeks now. The fruit is well soaked, and I have not tried more than a piece. I have used chilled red wine, and one day I substituted tonic water for the lemonade. I think in fact you could even try adding a little bit of grapefruit juice to make this sangria slightly more tart. Dave and I have enjoyed a glass of sangria while playing canasta most days – everything a holiday should be! To all my readers, I wish you all that you need in 2014! Thank you all for your support and comments. Must try out this recipe! Perfect drink for a summer’s day. I think another version needs to be made soon! I love that Australia and South Africa have the same or similar weather so we always have our recipes in tune! 😀 Fantastic looking sangria! Hi Tandy, happy new year! Your sangria looks so refreshing, so delicious! I haven’t made it in years…. 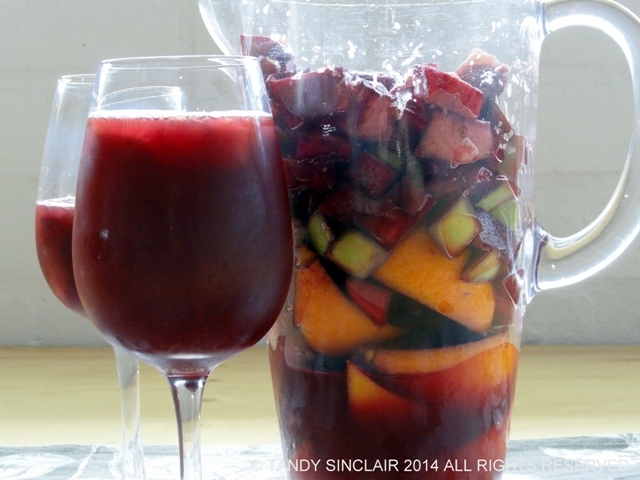 when I had the cooking school, we had a Spanish chef/restaurateur come to give a class fairly frequently… we always made a bucket of sangria for his classes! I think we have drunk a bucket of it this summer! Look at all the delicious fruit! Such a festive drink! For us, it’s a special occasion recipe but always comes with great memories.